RCA Directv Satellite Receiver 7M09 Model DRD431RG - FREE FAST SHIPPING! DirectTV RCA Satellite Receiver Model DRD435RH ORIGINAL REMOTE Sealed!! It just has a few very light scratch marks from use. RCA Universal IR Remote. Includes: Receiver, New Remote, Cable Jumper, Phone Cable and Direct Adio / Video Cables (all As Shown). Digital Optical Output, Audio/Video Output Jacks: 2 Sets, S-Video Output. You are looking at a DirectTV RCA Satellite Receiver Model DRD435RH ORIGINAL REMOTE Was sitting in storage have never opened. Please look at the pictures for more details and ask any questions you may have. If you have any problems or concerns please let me know I will do my best to to make it right. Thanks for looking. 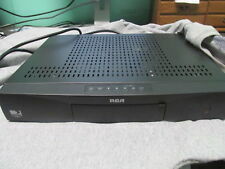 Two DirectTV RCA Satellite Receiver Model DRD435RH . Condition is Used. Shipped with USPS Parcel Select Ground. The DTC100 provides a comprehensive array of audio and video outputs, serving a range of display devices from standard TVs to many high-definition display devices. RF, Composite, S-Video and 15-pin VGA video outputs are supplied, along with RCA-type connections for analog audio in addition to an optical (Toslink) discrete digital audio output. RCA Digital Satellite Receiver Black Pre-owned Model DRD403RA.REMOTE INCLUDED. This item has been tested for power and it powers on with no issues at all. No further testing has been done and it is being sold as-is. Turns on but not tested. Soutbridge, MA. 333 Main St. Gordon-Lasalle Music. What makes the DTC100 most attractive is its versatility. RF, Composite, S-Video and 15-pin VGA video outputs are supplied, along with RCA-type connections for analog audio in addition to an optical (Toslink) discrete digital audio output (however, no COAX digital audio connection is included). RCA Direct TV Satellite Receiver Model DRD430RG Directv with remote. Condition is Used. Shipped with USPS Priority Mail. No remotes. Power Cables are Included! All pictures are taken in house. Let us earn your loyalty! stands to reason that issues will arise occasionally. We're eager to find an amicable solution when it does. opportunity to work with you in resolving any issues. Model DRD203RW & 2 Remotes & Instructions. I am easy to work with. I will do my best to answer promptly. WARRANTY:Sold AS is For Parts. You are buying as is. It is owned not leased! See pics to check with direct tv. Receiver System DRD102RW. The program provider sends its program material to the uplink site where the signal is digitally encoded. The program provider sends its program material to an uplink site where the signal is digitally encoded. Powers on and displays on TV. Remote works. It is clean, and fully functional. Don't miss out! We DO NOT dry clean, repair, clean/polish, or otherwise recondition our products; they are sold in "AS-FOUND" condition. I wish I was an expert in everything, but I'm old enough to realize that will probably never happen! 7M09, E157474, SN: B485BC3M6 (sticker is partially torn off, so this appears to be the SN as best as I can read it), refurbished; no access card. As pictured; nothing else included. Appears to have been barely used if at all. 65 inch tv FLOOR MODEL TV WITH BUILT N HIGH DEFINITION SATELLITE RECEIVER. 65"FLOOR MODEL WIDESCREEN GREAT CONDITION MADE BY PROSCAN A DIVISION OF RCA. IT HAS A BUILT N HIGH DEFINITION SATELLITE RECEIVER BUILT N IT.